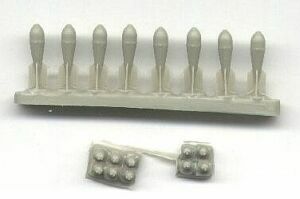 There are eight FAB-50 bombs with separate tips that include the arming spinner. Molding is exceptional and these are very crisp and well detailed. Very highly recommended. 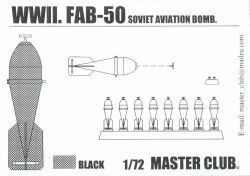 Other bombs made by Master Club include FAB-500, FAB-100M, FAB-100 and FAB-250. You will not be disappointed with these bombs. Our thanks to Linden Hill Imports for the review samples.